For God's sake - Get Out! If these walls could talk ... the screams would wake the dead. Based on the chilling best-seller, this "spooky study in psychological terror" (Los Angeles Times) throws open the doors to your deepest, darkest fears! The Long Island colonial house on the river's edge seemed perfect. Quaint, spacious and affordable, it was just what George and Kathy Lutz had been looking for. But looks can be deceiving ... and their new dream home soon becomes a hellish nightmare as the walls begin to drip blood and satanic forces haunt them with sheer, unbridled evil. Now, with their lives - and their souls - in danger, the Lutzes must run as fast as they can from the home they once loved ... or fall prey to its terrifying power! Starring James Brolin, Margot Kidder and Oscar-winner Rod Steiger, this bone-chlling, special effects-laden thriller will hit you where you live! $7.843 million on 748 screens. When I was 12 years old, The Amityville Horror was one of the very first "R"-rated movies I ever saw. It opened in the summer of 1979 and proceeded to scare the wits out of me - not that such a reaction required much at that age. I couldn't bear to stare out of our house's windows for weeks afterward due to my fear I'd see those creepy red eyes gazing back at me! Much of the terror the film inspired in me came from the allegedly true nature of the events upon which the movie was based. Although I was fascinated by the story at the time, I admit I've given little thought to the whole Amityville issue since then, so I have no idea what the "facts" of the matter were and how believable they may be. However, I do know it all seemed awfully plausible to my pubescent peers and me and all of that made the movie even more chilling. Whatever really happened in Long Island during the mid-Seventies, there's one thing I know for sure: I'm not 12-years-old anymore, and The Amityville Horror is a pretty crummy movie. What seemed so scary then just looks dopey now, and the film has absolutely no effect on me as an adult. Newly-married George (James Brolin) and Kathy Lutz (Margot Kidder) and their three kids – hers from a prior relationship - move into a lovely Long Island house with a bad history. A teenager went bonkers and slaughtered his family there a year prior to the arrival of the newlyweds. Once they enter, strange events start to occur, and much funky weirdness results. Whether or not Horror was ever original, it still doesn't make it a good film. The plot moves along at a slow and obvious pace, as it telegraphs all the events from a mile away. The cast seems flat at best - Brolin's shaggy haircut scared me more than his “menacing” acting - and histrionic at worst. Rod Steiger chews so much scenery he much have gotten indigestion. Even those red eyes aren't spooky anymore. In fact, they just look silly. Since I only saw Horror once as a kid, I'd built up an internal myth about those eyes, as I'd convinced myself the scene in which they appeared showed something even more horrific. Nope - it's just a pair of fake-looking red eyes. Thomas Wolfe was right - you can't go home again. Probably the scariest aspect of Horror comes from the real-life happenings of its stars. Margot Kidder got seriously injured in a 1990 car crash, and she also went nuts a few years later. Brolin married Barbra Streisand. Who suffered the worse fate? Boy, that's a tough call. I enjoyed seeing The Amityville Horror from a semi-nostalgic point of view. I liked it a lot as a kid and was curious to see if it still possessed any terror. Unfortunately, it doesn't. It's just another cheesy film from the Seventies that lost its luster years ago. 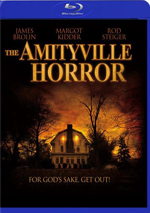 The Amityville Horror appears in an aspect ratio of approximately 1.85:1 on this Blu-ray Disc. While the image showed its age, it usually looked pretty good. Sharpness was okay. Some of this reflected the original photography, which I suspect never rendered a particularly detailed image. I thought matters usually seemed acceptably concise and distinctive, but wider shots took on a moderately soft tone. No issues with jagged edges or shimmering occurred, but I did see some mild edge haloes at times. Grain seemed natural, so I didn’t detect any obvious noise reduction, and source defects were mild; I saw a couple of small specks but nothing more egregious. The film's palette seemed fairly subdued but was generally nicely-saturated. Within the visual design, the colors appeared appropriate and clear. Black levels were a little soft and mushy, and contrast appeared a little overly dark at times. This affected shadow detail, which came across as acceptably visible but not as clear as I'd like. None of these issues created big concerns, though – and many reflected the 34-year-old source – so this ended up as a perfectly watchable “B” presentation. I felt no qualms when I decided to give a “B+” to the surprisingly effective DTS-HD MA- 5.1 soundtrack of The Amityville Horror. Remixed from the original monaural audio - which also appears on the disc - the 5.1 edition gave us a broad and natural soundscape. The track used the sides to present a lot of good atmospheric information, and the surrounds kicked in with a fair amount of material as well. These added a lot to the movie’s attempted chills. From a thunderstorm at the beginning of the flick to gunfire and other aggressive sequences, the track put elements in their proper places and blended them well. Music showed nice stereo delineation as well, and the entire package was involving. Matters occasionally tended toward the “speaker-specific” side of the street, but not as prominently as I’d expect. We even got some good stereo surround usage, with a few elements that popped up in particular rear speakers. When I accounted for its age, the quality of the audio was also pleasing. Speech lacked much edginess and consistently sounded natural and distinctive. A few louder lines became a bit rough, but they were well within the realm of acceptability, and intelligibility remained good. Music needed a little more range but was still quite satisfying for something from 1979, as the score usually sounded smooth and full. Effects failed to present much distortion. Those elements were usually nicely concise and accurate, and they packed a good punch in the louder sequences. All in all, the 5.1 mix of Amityville was a winner. How did the Blu-ray compare with those of the prior Special Edition DVD from 2005? Audio was fairly similar, though the lossless mix offered a bit more heft. Visuals showed the more obvious improvements, as the Blu-ray seemed cleaner and more distinctive. The Blu-ray drops virtually all of the extras from the 2005 DVD. In addition to the trailer for Amityville, we get promos for Species and The Terminator - and that’s it. The Amityville Horror is nothing more than a silly trifle. It may have spooked me 34 years ago, but it can't muster even a minor chill now, and most of the film just seems goofy and overwrought. The Blu-ray provides pleasing picture and audio but lacks bonus materials. It’s a shame the Blu-ray drops the prior DVD’s extras, but this remains the best presentation of the film itself.